What is the best tide to fish ? I know of anglers, and even captains and guides, who plan every day they fish or not fish based on the tide. There are other anglers who fish only the first third of an incoming tide and/or the first third of an outgoing tide and then party or lounge the rest of the day. There are plenty of anglers (myself included), guides and captains who fish all day, adapting to the tide that is before them. Anglers who fish all tides are constantly improvising and learning where to fish and how to take advantage of fish that you may never considered fishing for because they only appear during a certain tide phase. Yes, there are certain sections of a flat where I want to be during a certain tide, but over the years, I have had some splendid fishing during tide phases ignored by others. My personal answer may sound cliche, but the best tide for me to fish is the one I am dealing with at the time. I learned a great deal over the years while fly fishing every tide phase. Anglers who fish all tides discover areas that provide the fish with ample water to navigate, feed and feel safe. I have hoisted fish out over the water with an ear-to-ear grin for a hero shot, as well as stumbled or motored out of a flat with my ego tucked between my legs and a camera full of bird and sunset photographs after I have fished every cycle of a tide. Here are some some basics that have helped me make fly fishing in all tides simple. The sea level on any coastal body of water will rise and fall by the gravitational forces of the moon, sun and rotation of the earth. These tides may affect the depth of a body of sea water over a flat a few inches up to several feet depending on its location. The tide may alter the potential location of a targeted fish to within a few feet to several hundred yards, or maybe not at all. Tides may be effected by the shape of the shoreline, the contours of flats floor and the wind to some degree. Learning about the tide in a new area can be complex, and having an experienced guide or captain will really help that learning curve. I have been awe struck with the skill of seasoned guides and anglers that fish water affected by the tide. If you are with one of these anglers, trust them about how, when and where they are fishing, and even what they are fishing for because it has a great impact on your success. Here are some some basics that have helped me simplify fly fishing all tide phases. It takes the earth 24 hours to rotate under the moon, so the time between lunar tides fluctuates about 12 hours. A tide clock is divided into two six-hour tidal periods that show the length of time between high and low tides. If you are new to the area, it is a good idea to look at a tide chart so you can determine what tide you are going to be fishing. After some time in the area, you can determine what is a low or high tide, or even in between, based on the make up of the surrounding water depth and currents, but it takes time to pick up on the subtle or significant changes. During high tide, I find that fish and fish food may be scattered all over the place. Bonefish and permit may be found deep in the flooded mangroves, feeding along the flooded shoreline, or directly in the breaking waves against the shore, or even feeding in the deeper sections of a flat. There are plenty of places a fish and it's food source may be during high tide. Anglers can enjoy all the vast areas of a flat available during a high tide. The larger fish on the flat that have lingered in deeper water have more of the flat to navigate and find food. The food source has the entire area to move, feed and hide. As high tide rolls in, I generally focus on the newly flooded areas of a flat or shoreline in hopes of finding activity created by the increased area covered by water. This changing water depth creates a feeding frenzy when the shallow dwelling food source is evicted, or now becomes accessible to larger fish. This feeding activity may slow after the initial tidal flows impact them. I like to focus on the shoreline and flooded area's of a flat during the first third of the new tide. 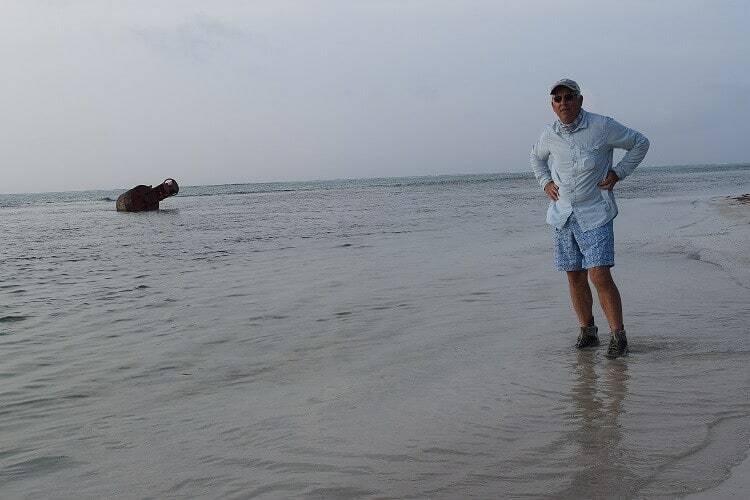 After checking out other deeper sections of a flat, I have found it to be a good option to return to the shoreline and flooded locations during the middle, or even the end, of the high tide cycle, and I often find lingering bonefish and permit. Some things may happen on a flat that you will only experience during high tide ! After high tide peaks, the water depth remains for a while before it starts to recede. Fish and fish food will now be on the move again. Crab, shrimp and small fish are in a panic looking for new sanctuaries. As this food moves, so moves the fish that prey on it. This can be a great time to find bonefish and permit in water that has a strong outgoing current where fish food is getting pulled or forced out of by the ebb tide. All fish and fish food seem to be active in the shallows during the first third of this outgoing tide. Try to isolate and pay close attention to the strong out-going current near cover and contours of the flats that I believe will support fish looking for food. 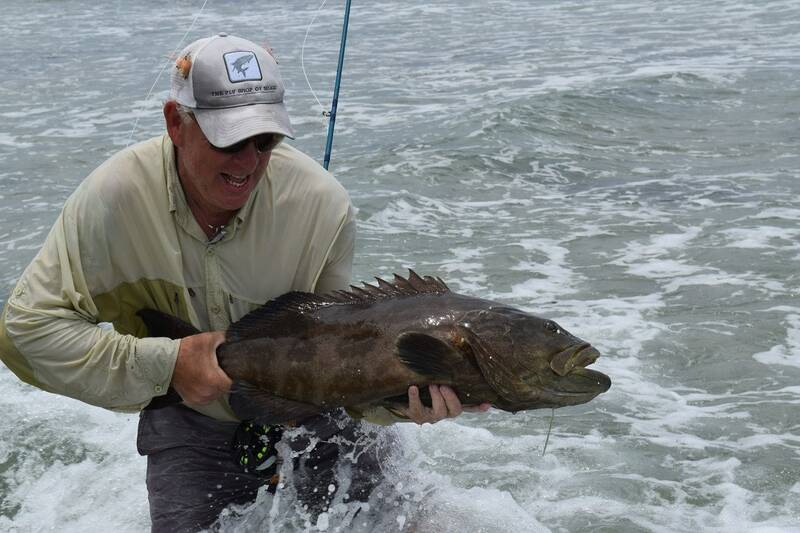 Many anglers have some of their best flats fishing during this phase of the tides. 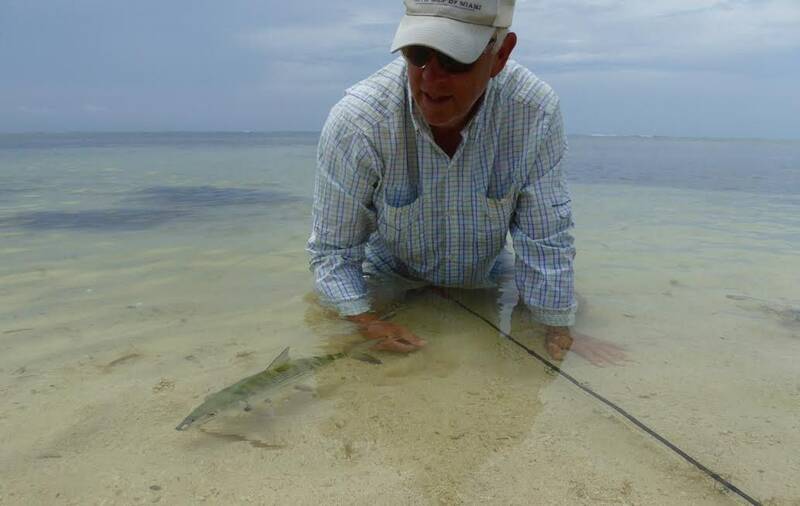 On one recent outing during this tide, my partner and I had so many bonefish and permit to cast to I stopped watching for sting rays and learned the hard way why you never want to step on one. During the mid to tail end of the low tide cycle, I tend to fish the deeper contours and structure and edges of deep channels of a flat. I look for water where I feel fish are comfortable and may still find food. Low tide seems to always isolate the fish into likely area's on the flat that start with feeding areas along the shallows then out to the water away from the shoreline that provide more depth, cover and food. 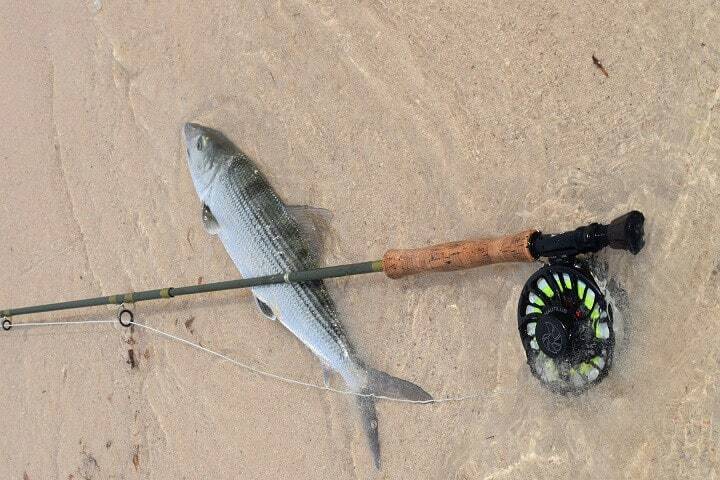 A nice Southern Yucatan bonefish picked off inches from the shoreline at the start of a low tide. Some argue that this tide phase is the time to eat a sandwich and drink a beer, but I disagree. In some of the waters I fish, I've found it may appear to last longer than it actually does. Without wind, it becomes calm and almost eerie in its deadness. If you look close, there may be currents starting to form shortly after a high or low tide cycle. As current slows or stops, I've found bonefish congregating in large numbers in deeper contours, like the mouth of creeks and channels or contours of a flat. It's like an after-dinner fish cocktail party following a tide phase. I've found fish congregate for a few minutes, and are just like many fly casting anglers. They are waiting for the next tide phase dinner bell to ring before they move again. When I've found these congregated schools of bones during a slack or dead tide I have been treated to some epic bonefish action. I have witnessed guides that will chase a tide so they can squeeze every moment out of a tide phase, They accomplish this by moving ahead of the slack tide areas. This takes serious talent that is learned by spending years fishing the tide in that area. While the slack phase is taking place, I also tend to look for those last dying currents on the flat for a greedy fish that may be picking off the last morsel of what a dying tide may bring. The tidal current during any cycle will almost always be changing. At the start of an inbound or outbound tide, it may appear that the current flow is just that, as in a strong vertical flow straight into the shore, or vertical flow straight away from the shore. Later in the tide, currents may change and run parallel to the shoreline. As tidal currents form on a flat, they may flow in many different directions. When these currents collide, it will create a washing machine effect as it churns the bottom of the flat and uncovers fish food. Fish will look for this food in these altering currents and churned up sections of a flat. I have witnessed dozens of permit dashing in and out of a newly churned section of the flat, and in minutes the currents changed and all the permit left. These currents also seem to attract a diverse population of fish to a flat. I have had to pull out the ocean fish identification book a few times to figure out what the hell I had been catching that day. I have had success changing my position in a flat so I can view and approach these changing currents and water conditions. I always approach currents now with great anticipation. How about 7 days of each for $4995?